Our selection of Art Attractions, Hotels, Restaurants and recommendations for York visitors. 40 miles south West of York - The Yorkshire Sculpture Park in the parkland of Bretton Hall, near Wakefield, West Yorkshire is a superb open-air gallery showing works by UK and international artists, including Henry Moore and Barbara Hepworth. One of Yorkshire’s newest art galleries, The Hepworth Wakefield plays host to temporary exhibitions and a spectacular collection of contemporary art, including pieces by renowned artists Henry Moore, David Hockney, LS Lowry, Jacob Epstein and of course, Barbara Hepworth, for whom the gallery is named. Leeds Art Gallery is a lively gallery in the heart of Leeds on The Headrow in Leeds' Cultural Quarter. The gallery hosts a dynamic programme of changing exhibitions in addition to Leeds’ own stunning collection, which was been designated by the government as of national importance. 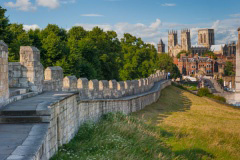 No visit to York would be complete without a walk around the City Walls. At 3.4 kilometres long, the beautifully preserved walls are the longest medieval town walls in England. The completion of the entire circuit will take approximately 2 hours. 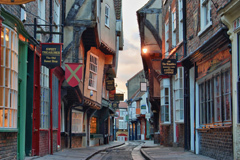 Arguably York's most famous street, The Shambles is lined with timber-framed buildings, some of which date back to the fourteenth century. The street offers a mixture of eateries and shops, including a bakery and a pie shop. The Cathedral and Metropolitical Church of Saint Peter in York, commonly known as York Minster, is the cathedral of York, and is the largest gothic cathedral in Northern Europe. It also home to the Great East Window, the largest expanse of medieval stained glass in the world. One of the finest boutique hotels in York. A luxury hotel located in a city centre Regency Townhouse, The Grange offers stylish and elegant accommodation with a 5 star bed and breakfast service. It also boasts a fine dining restaurant, which serves afternoon tea during the day. The Grange has generously offered an exclusive discount for York Fine Arts customers. Contact the gallery for details. A 15-minute walk from York train station, this boutique hotel occupies a Victorian townhouse. The elegant rooms are furnished with antique furniture and Italian fabrics, and some offer four-poster beds and/or claw-foot tubs. There's also a breakfast room, a cosy lounge bar and a walled garden. Marmadukes Town House Hotel has generously offered an exclusive discount for York Fine Arts customers. Contact the gallery for details. Yorkshire's only five star hotel, The Grand boasts 107 luxury bedrooms and an invigorating spa within its Edwardian building. Overlooking the historic city walls of one of the UK’s most picturesque cities, The Grand offers the best in traditional English style and service. An intimate bistro serving award winning creative and traditional dishes that celebrate Yorkshire produce. Having forged a sterling reputation for culinary excellence over the past ten years, Café no8 offers an exceptional dining experience in the centre of bustling, historic York. One of the best fine dining restaurants in york, Melton's Restaurant offers upmarket modern British dishes in an intimate setting using the best of locally sourced fresh produce. Listed in Good Food Guide, AA Guide, Michelin, Square Meal and all major food guides.